UFO SIGHTINGS DAILY: Newmarket man spotted UFO at Oshawa Harbour, Canada June 22, 2016, UFO Sighting News. Newmarket man spotted UFO at Oshawa Harbour, Canada June 22, 2016, UFO Sighting News. Check out this UFO over a ship in Canada last month. It made the Oshawa news today and its more evidence that UFOs are seen as frequently over the water as over the land. If a UFO can be air tight in space, then is should also work similarly underwater. In this photo the disk looks like its over the ship, but the ship is focused, and the UFO is blurry, so I believer the UFO is further away, far behind the ship. 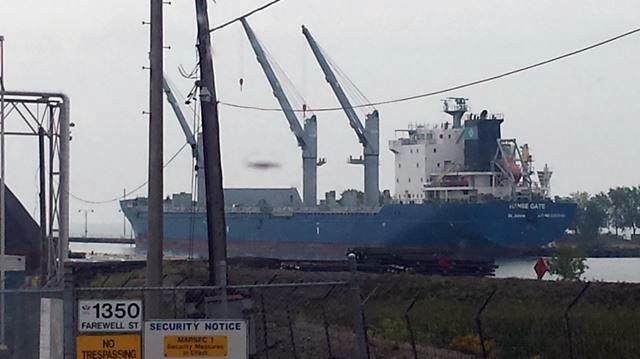 OSHAWA - Daniel Koostachin said he had a bad feeling, like he was about to enter a haunted house when he showed up to the gates at the Oshawa Harbour on June 22 around 9:30 a.m., alone to pick up some metal rebar for a company he drives transport truck for. Mr. Koostachin said he checked his surroundings, looking left then right and that’s when he saw “the object” hovering over the waters of Lake Ontario. He managed to snap a couple of photos with his camera before “it took off into the sky. Mr. Koostachin described what he saw as a black object that was a disc shape. He said he has always been a believer that UFOs exist and thinks he has seen them before but this time was different. “I’ve never been close enough to see it and get proof. I was hoping it’d take me but it didn’t that day,” he joked.